For the last fortnight or so the London area (and Weymouth) has hosted a series of events that will form part of the Olympic Games of 2012. Very large crowds have turned out, notably for the cycle road race, whilst numbers have been deliberately restricted for some events, typically the Beach Volleyball and Basketball. During this period London (and the whole of England) has been subject to the sort of civil unrest that we thought was the prerogative of other nations, although history relates that over the past 1,000 years social turbulence has always been a problem. However Wat Tyler and the like did not have mobile phones and Blackberries and when caught the punishment was much more severe than that meted out today. As Lord Coe pointed out, whilst a very bad thing, the other events happening in London did not affect the games build up, or was noticeable to Olympic officials and the vast majority of spectators. Britain’s capital is very resilient. Your Editor took in three events as part of London Prepares, and very much enjoyed them all. Sited on a temporary structure in Horse Guards Parade the ladies beach volleyball was very athletic, eventually won by Brazil, but easily followed by an audience that for the most part had never seen the sport before, except perhaps on TV. The commentary was fine, big screens helping out, and American style cheer leaders entertained between sets. The bikinis worn by the participants have to meet regulations regarding size and fitting, we are told because this suits the action of the sport. That’s the official line and AERBT supports it. Entry was from the Palace side of the parade ground, not Whitehall, which does offer access, and there was very limited and expensive food for sale. At the BMX, see below, chips were £2.60 for a platter! Bringing in your own refreshments was banned, a daft rule that even Disney has had to drop for its own theme parks. No ice creams for sale on a hot August day and you cannot go outside to purchase. Security was tight with all metal objects subject to a screen search. See COMMENT. 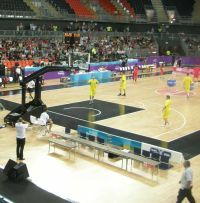 The basketball was the first competitive event at the QE Olympic Park in the temporary £40m sports hall. Access here was via Stratford Regional, very simple on the Central Line from town, but also extremely busy on an afternoon when only 3,000 people were attending the single event. It could be up to a quarter of a million on a busy Olympic day. Within the arena handrails are provided on the upper tiers, but not for the lower seating. Your News Editor managed to fall down and became the first spectator to be treated by the (excellent) medical facilities provided on site. A great new venue was marred by very poor acoustics and once again problems with the catering. No ice cream once more and very long refreshment queues. 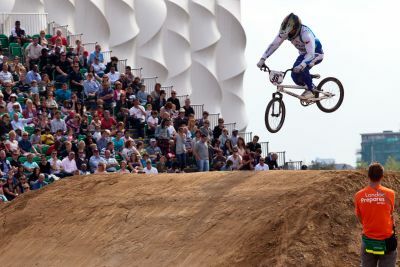 The BMX was the third Olympic sport watched by your scribe and a full house of 6,000 spectators. Access and security was via the same routing as for the nearby basketball and worked fine. Time trials were the order of the day for the track’s official opening very well organised in spite of torrential rain just 24 hours back. Reminiscent of a ski slope the start is 150ft up and down a steep slope at up to 45mph before catapulting into the air. Brave lasses and lads take part. The track twists and turns through 500 yards, the ladies taking a slightly different shorter route and through a mini-tunnel. It’s all over in under 40 seconds for the fastest. And yes the medical staff were kept busy. BMX is a seriously dangerous sport. Health and Safety should keep away. It was a lovely warm day sitting in the stands listening to the commentary and mood music, but once again no ice cream. We also believe that a big effort is required to ensure that all the staff on the site can speak and understand English. This is a very serious problem in a multi-national society (and having to put up with BT’s overseas call centres in the last two weeks has not helped one’s patience in these matters). Everyone smiled and “have a nice day” was the standard goodbye turn of phrase even as we left.